We usually wind up with a lot of overripe bananas in our house. I don’t eat them (heartburn), Tanner dislikes them, and Jim loves them, but only eats them when they’re very green. As a result, the bananas often wind up getting too ripe for Jim. Once that happens, I just let them go until they are darkly speckled. That’s when I bake banana bread. Today I had a batch of bananas that were overripe, and I mentioned to Jim I’d be making banana bread for him to take to work. “Can you make Bananas Foster bread?” he asked. After thinking about it for a few minutes, I decided I probably could. I just needed to make really moist banana bread with a strong banana flavor and glaze it with some kind of a rum, brown sugar, and cinnamon glaze. I started with Cooks Illustrated’s “Ultimate Banana Bread” recipe knowing it packed a powerful bit of banana flavor. Then, as it cooled, I got to work on my Bananas Foster Glaze. I realize some of the steps in the recipe seem kind of odd, but they really pay off in getting great banana flavor without weighting down the loaf. Of course, you could also make your own favorite banana bread recipe and then just use the glaze. Place peeled bananas in a large bowl. Cover with plastic wrap and cut a few slits into the plastic. Microwave the bananas on high until they release all their juices, about four to five minutes. Place a fine mesh strainer over a bowl and pour bananas and liquid into the strainer. Allow it to sit for 15 minutes, stirring it occasionally. The liquid from the bananas should collect in the bowl. As the bananas sit, heat your oven to 350 degrees. Spray a 8-1/2 x 4-1/2 inch bread pan with nonstick cooking spray. Put the bananas in a medium sized bowl. Pour the liquid from the bananas into a small saucepan. Simmer the banana liquid until it is reduced to 1/4 cup. Pour the liquid from pan back into cooked bananas and stir until well combined, mashing the bananas to make them smooth. Set aside the pan you used to cook the banana juice to use when making the glaze (the remaining banana flavor will help flavor your glaze). To the bananas, add brown sugar, butter, eggs, and vanilla. Whisk until well combined. Pour the banana mixture into flour mixture and fold carefully until just combined. Pour the batter into your prepared bread pan. Bake until a toothpick inserted into the banana bread comes out clean, about 55 minutes to an hour. Allow the bread to cool on a wire rack for about ten minutes, and then remove it from the pan. Cool completely before glazing. Stirring constantly, heat butter and sugar over medium heat in a saucepan until the brown sugar dissolves. Add cream, rum, cinnamon, and salt. Bring to a complete boil, stirring constantly. Remove the mixture from the heat and allow to cool until the glaze has thickened. Place the cooled banana bread on a piece of parchment paper. Pour glaze over banana bread. 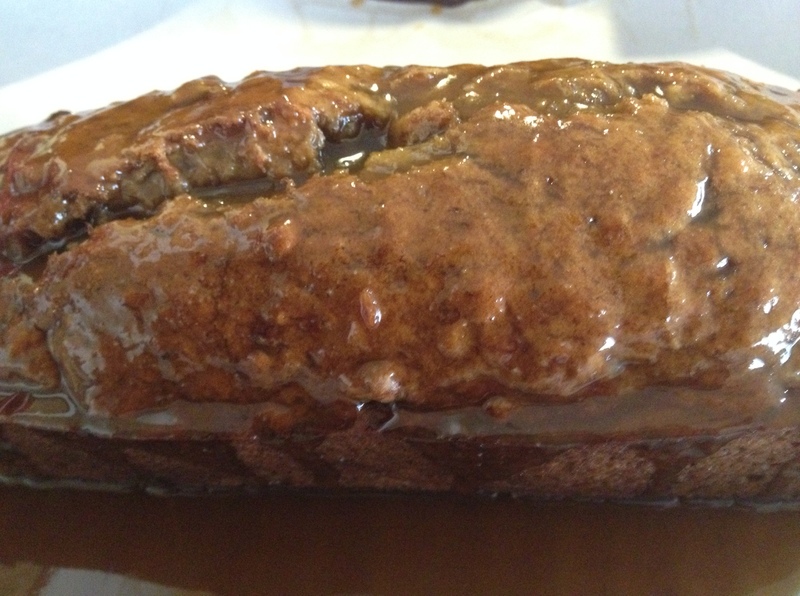 Allow the glaze to set, and then carefully move banana bread to a plate to cut and serve. I spend a lot of time trying to come up with interesting lunch items for my son. I’ve long been dissatisfied with school lunches, and so has he. This year, I’ve been making his lunches for the week on Sundays so I don’t have to worry about it for the rest of the week. I like this recipe because it takes care of a side dish for Sunday dinner, and it provides lunches for a week (the recipe makes eight crescent rolls and eight ham and cheese rolls. If you don’t want to make your own crescent roll dough, you can always use refrigerated crescent rolls, although they aren’t nearly as flavorful and they’re pretty small. A quick tip on baking – I prefer regular yeast to rapid rise yeast. The reason is I believe that a dough that rises more slowly has time to develop better flavors. You can use a quick rise yeast, which will cut the rising time by about half. You can also replace the shortening with softened butter, although shortening gives the rolls a more tender crumb. 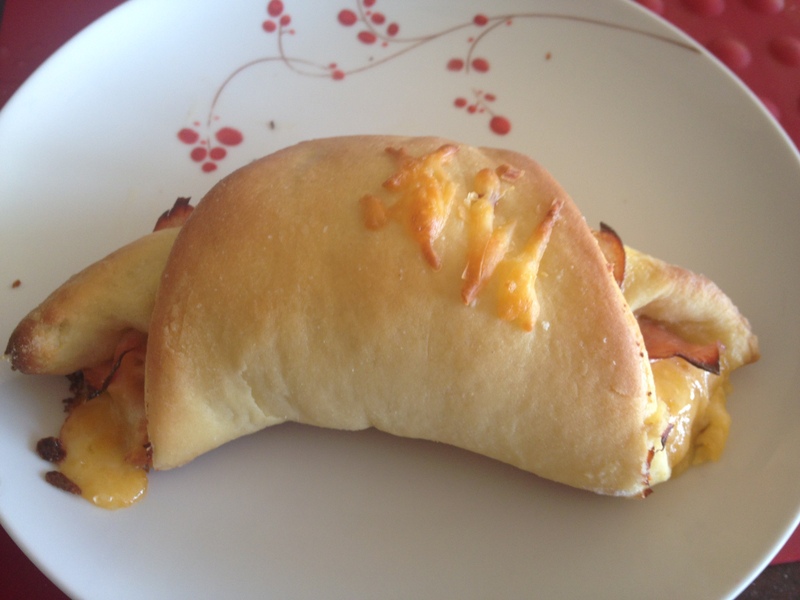 If you like, you can sprinkle the ham and cheese rolls with a bit of cheese before baking. In a medium sized bowl, combine sugar, salt, eggs, and shortening. Use a mixer to beat on high speed until all ingredients are combined. Add yeast mixture and flour. Stir until a smooth dough forms. Turn dough out on a well-floured surface and knead until dough is springy and elastic, about 10 minutes. Place in an oiled bowl, turning to coat dough in oil. Cover and allow dough to rise in a warm spot until doubled, about 90 minutes. Punch down dough. Divide into two equal balls. Roll out each ball on a floured surface into a round that is about 1/4 inch thick. Spread each round with half of the softened butter. On one round of dough, lay out slices of deli ham to cover the entire round. Sprinkle with grated cheese. Cut the rounds into eight wedges (pizza style). Roll each wedge into a crescent roll from the wide end to the point. Place rolls on parchment lined baking pans. Cover and allow to rise for an hour, until rolls are doubled in size. Bake rolls for 12 to 15 minutes, until cooked through and golden brown on the outside.